MEDITERRANEAN SEA (NNS) -- On April 9, the commanding officers of Arleigh Burke-class guided-missile destroyers USS Ross (DDG 71) and USS Porter (DDG 78) received phone calls from President Donald J. Trump. The president called to thank the commanding officers, Cmdr. Russell Caldwell and Cmdr. Andria Slough, and their crews for their professionalism and quick response to the tasking to conduct a cruise missile strike against Shayrat airfield in western Syria April 7. This strike was in response to the use of chemical weapons by the Syrian regime. Ross, commanded by Cmdr. Russell Caldwell, forward-deployed to Rota, Spain, departed on its fifth forward-deployed patrol April 3 and is conducting routine patrols in the U.S. 6th Fleet area of operations in support of U.S. national security interests in Europe. Caldwell took command of Ross Nov. 12, 2015, and is scheduled to be relieved by the current executive officer, Cmdr. Brian Gallo, in a ceremony onboard the ship April 11, in port Larnaca, Cyprus. "The success of this mission hinged upon our Sailors' excellent training, technical knowledge and dedication to their work," Caldwell said. "It was a distinct honor to hear firsthand from our commander in chief that these operations had a direct impact in support of his national objectives." USS Porter, commanded by Cmdr. Andria Slough, forward-deployed to Rota, Spain, departed on its third forward-deployed patrol Nov. 30, and is conducting routine patrols in the U.S. 6th Fleet area of operations in support of U.S. national security interests in Europe. "In general, the President was impressed with Porter's precision and lethality. It was obvious he was extremely pleased with our performance and is glad we're out here patrolling in U.S. 6th Fleet," Slough said. Slough took command of Porter Jan. 28, 2016. In February Porter went to the Black Sea and participated in the Romanian led exercise Sea Shield. In March, Porter participated in the multilateral Allied Maritime Command anti-submarine, anti-surface warfare Exercise Dynamic Manta 2017. Also in March, Porter was awarded the 2016 Atlantic Fleet "Bloodhound" award, signifying the best ship in the fleet at anti-submarine warfare. U.S. 6th Fleet, headquartered in Naples, Italy, conducts the full spectrum of joint and naval operations, often in concert with allied, joint and interagency partners, in order to advance U.S. national interests and security and stability in Europe and Africa. 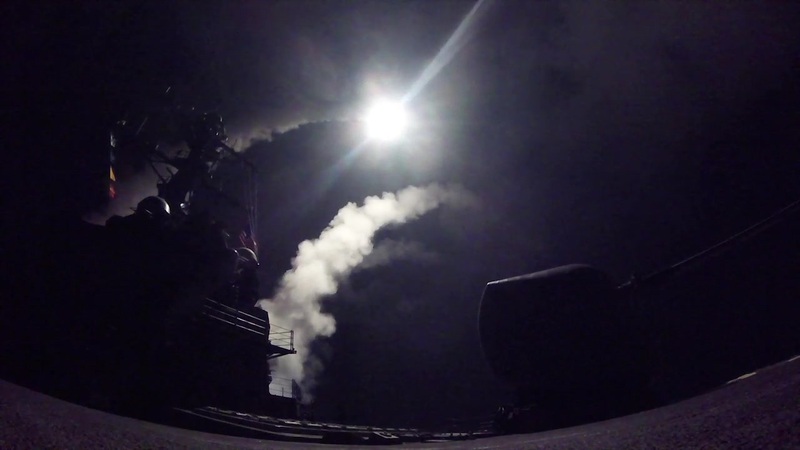 The strike was conducted using Tomahawk Land Attack Missiles (TLAMs) launched from the Eastern Mediterranean Sea. A total of 59 TLAMs targeted aircraft, hardened aircraft shelters, petroleum and logistical storage, ammunition supply bunkers, air defense systems, and radars. As always, the U.S. took extraordinary measures to avoid civilian casualties and to comply with the Law of Armed Conflict. Every precaution was taken to execute this strike with minimal risk to personnel at the airfield.